Let me be honest here: if I suffered the injuries that Global RallyCross driver Toomas “Topi” Heikkinen suffered three months ago, the last thing I’d be doing right now is getting back behind the wheel and getting ready for an upcoming race. Plenty of other minor cuts, stitches, bumps, and bruises. The banged-up dude had surgery to insert a plate and seven pins to get his ankle to heal properly during a five-day stay in an LA hospital. When he was let out, he returned to his home in Joensuu, Finland, where he continued his recovery. Heikkinen had the cast removed August 6, his boot off in mid-August and he started walking on his foot Sept. 3 (three weeks ago!) He began physical therapy the same week. Just to re-cap as to what caused all of this, the 21-year-old driver crashed during a RallyCross practice for the X-games Los Angeles event when he tried to clear a 50-foot-gap but instead went headfirst into a metal jump ramp. Here’s video of the incident and a warning – if you don’t like seeing people crash headfirst into things, especially at high rates of speed, then you might want to skip this video. Pretty gnarly stuff, right? Well that was three months ago and now Heikkinen is getting ready to race again. It features a 600-horsepower Ford Duratech 2.0 liter engine with Garrett Turbo that will deliver 650 foot-pounds of torque at the wheels and is capable of going 0-60 in less than two seconds. Heikkinen is scheduled to practice the new car Tuesday and Wednesday and if all goes well (knock on wood), he’ll race this Saturday at Las Vegas Motor Speedway. From the makers of the best portable speaker in the world to the craziest mo-fo rallycross driver on the circuit, best of luck man. Best of luck. Exciting news: ESPN announces that they’re bringing their X Games series to three brand spanking new countries starting next year. 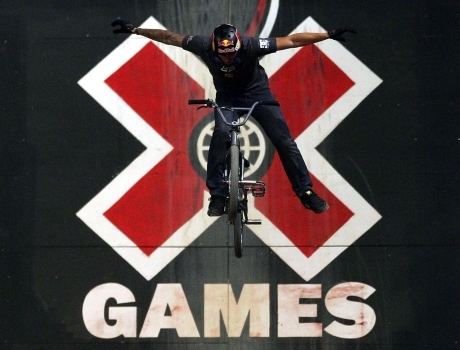 The X Games will now travel to b-e-a-utiful Foz do Iguaçu, Brazil; Munich, Germany; and Barcelona, Spain. They will join cities already on the circuit Aspen, Colo.; Los Angeles, Calif.; and Tignes, France.